Simply LIKE the dedicated POST on my Facebook Page to enter the draw. 500 followers on Instagram ! It’s time to celebrate, right ? I am giving you a chance to win one all-over print Shirt featuring one of my designs ! Please also feel free to like my fb page or to share the fb post with your friends if you like my artwork ! Which design is your favorite ? Do not hesitate to post a comment below ! Participation ends on Tuesday, February 2nd, 2016 at 11pm GMT. One randomly picked winner to be contacted by facebook private message and to be announced here & on fb within 24 hours. By participating, entrants agree to abide by all of the following RULES & REGULATIONS. 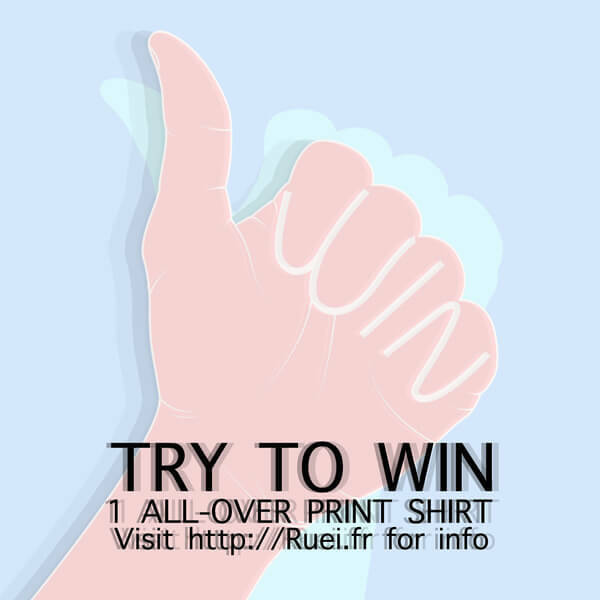 This random draw is organized by Ruei.fr and is no way sponsored, endorsed, administered by, or associated with Facebook, Society6, Instagram or any other company. No purchase is required. A valid Facebook account with private messaging enabled is required to participate. Sweepstakes starts when the dedicated post will be made available on Facebook. Liking or Sharing this page on ruei.fr or my Facebook page will not qualify you to enter the draw. The winner will be randomly chosen among those eligible participants who liked the dedicated post available on https://www.facebook.com/rueifr before the deadline. Participation ends on Tuesday, February 2nd, 2016 at 11pm GMT. One randomly picked winner to be contacted by facebook private message and to be announced here & on fb within 24 hours. Prize : One All-Over print shirt featuring one of my designs. The Winner agrees to have his Facebook name, country and prize published for the purpose of this random draw result announcement, not limited to Facebook, Ruei.fr, “Rueifr” Tumbler, Twitter and Instagram accounts. One all-over print shirt featuring one of my designs (excluding any other design), available only from https://society6.com/ruei/all-over-print-shirts, selected by the winner, will be ordered from Society6 and paid by Ruei.fr (including shipping) to be shipped to the provided name & address. The winner will be prompted to mention desired size, depending on available stock ; otherwise “L” size will be picked up. Current retail value : USD $34 + Shipping. No returns, no monetary refunds or cash value. No participation cost reimbursement. Organizer not responsible for and accepts no liability in relation to any aspect of the prize. Failure to answer the Facebook private message, to provide the name of the desired design among those eligible or to provide proper name and proper delivery address within 1 week will result in prize cancellation. Participants must be of legal age in their country of residence to participate. Participation may be restricted in certain countries. Family members of the organizer may not participate. Some international delivery restrictions may apply. Organizer reserves the right to cancel, amend or suspend this sweepstakes, or to amend these rules, without prior notice or obligation, for any reason.